Ocado, the world’s largest online grocery, operates three marquis brands in addition to their flagship supermarket. To boost conversion rate and average order values across Fetch, Fabled and Sizzle, Ocado used Dynamic Yield to personalize recommendations and send individualized messaging based on user behavior. Ultimately, the retailer drove 8X more conversions from recommendations while also boosting high-value orders by more than 20%! Across its portfolio of lifestyle brands, Ocado oversees a vast product set targeted towards a plethora of consumer profiles. That’s when they turned to Dynamic Yield to craft individualized experiences. To ensure that each visitor received the most relevant recommendations, Ocado used Dynamic Yield to adjust the recommendations strategy based on stage of the buyer journey. 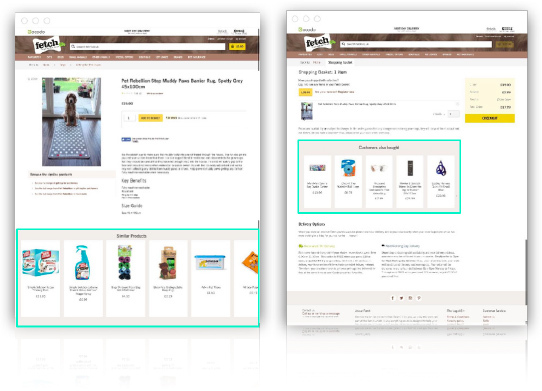 For example, visitors to product pages received personalized recommendations or similar items to optimize for conversions while recommendations in the basket focused on items commonly bought together. PDP recommendations in particular demonstrated a massive uplift, delivering 8X more conversions than a control group in which no recommendations were shown. The Homepage recommendations in which Ocado tests “Free Gift” recommendations vs. “Newest is” has demonstrated a 54% uplift in CTR. In order to immediately engage visitors and drive customer awareness to its strongest value propositions, Ocado launched a site-wide skinny banner highligtinging three key messages, chosen dynamically out of eight different variations based on the customer’s status and stage of the journey. 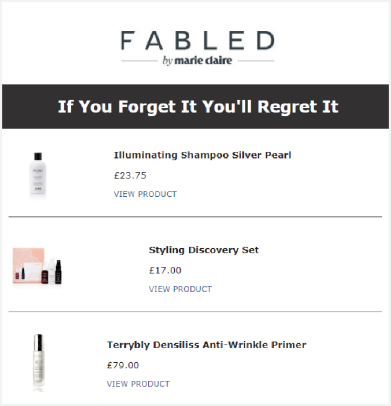 For example, new customers were shown a first-time purchase promotion, while returning visitors received price matching and next-day delivery messaging. 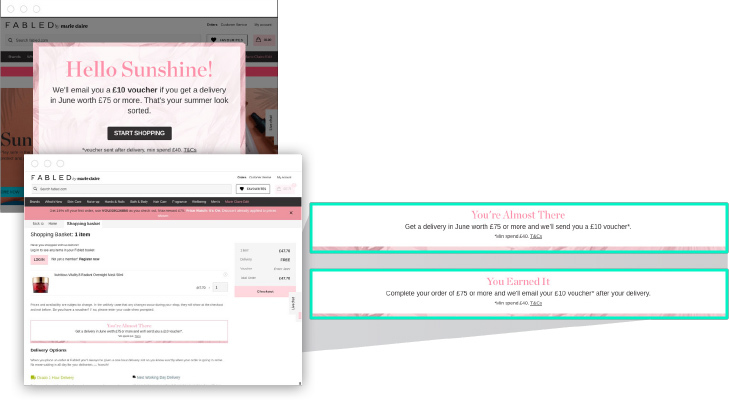 In addition, the skinny banner background adapted to the pagetype in order to re-engage customers. Once again, Ocado leveraged personalization centered around a user’s stage in the buyer journey via behavioral messaging served by Dynamic Yield. When a user first arrived on site, an overlay informed her that she would receive a £10 voucher if she spent £75 or more. As she navigated the site, various versions of that message would appear based on items in cart and onsite behavior. The highly targeted nudges paid off, resulting in 20% more baskets stocked with more than £75 of merchandise. 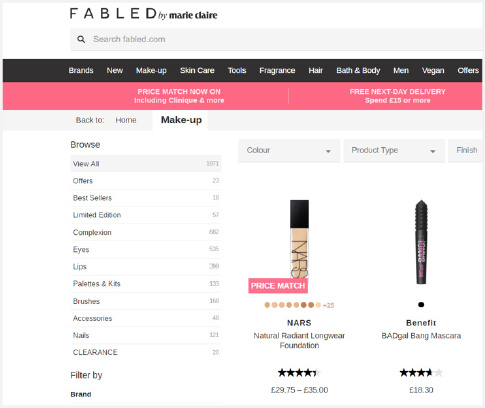 Since the cosmetics industry is highly competitive and driven by inspirational trend setters, Ocado launched Social Proof messaging to allow customers to see the most popular items on the website. After launching Dynamic Yield’s real-time social proof capabilities, which highlights the number of views and purchases every high-demand product elicits, Ocado saw a 9.8% uplift in revenue per user. To maximize potential to improve top-line growth, a successful personalization strategy must focus on delivering experiences in the context of where a shopper stands on the path to purchase. By basing personalization around a user’s stage in the buyer journey and real-time intent signals, Ocado was able to boost both conversion rates and average order values of customers already on the path to purchase. The result? Happier shoppers leaving with heftier baskets.